With accomplished, highly professional and friendly private music instructors, Music Teacher LA is the right place to take guitar and bass lessons at any age and experience level. Music Teacher LA founder, Olesya MacNeil, graduated with Masters Degrees in Music, Psychology and Pedagogy and has been providing private music lessons since 1991. She was a highly sought after music teacher in Los Angeles and taught the children of Larry King, Billy Baldwin, Dan Beckerman (the LA Kings’ governor), Susannah Grant (the Oscar-winning screenwriter), Bennett Schneir (the animated film producer), and many other local families. Olesya assembled a team of unparalleled standard and experience in Los Angeles who share her burning desire and enthusiasm for quality music education. Learn more about our founder here. 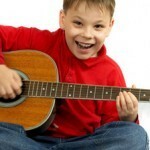 Music Teacher LA provides quality acoustic and electric Los Angeles guitar lessons for children ages 6.5-up and adults. Bass guitar lessons usually don’t begin before age 8, with many students learning the acoustic guitar before starting on bass. Younger beginners can learn on a 3/4 size guitar designed for students with smaller bodies and shorter arms. Parents of very young children need to understand the advanced dexterity required to play chords on a guitar successfully. Our Los Angeles guitar lessons are customized for each student, taking into consideration his or her tastes, styles and levels. Our highly accomplished Los Angeles guitar teachers offer lessons on acoustic, electric, and bass guitars ranging from four to eight strings. Guitar and bass students learn rhythm, tablature, notation, chords, memorization, sight reading, technique and improvisation. 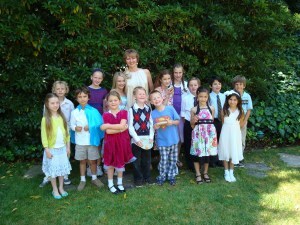 Music theory, composition and music production can also be taught per student request. The guitar lessons are offered seven days a week in the comfort of your home or in our studios throughout Los Angeles. It’s easy to get started! Contact our professional and friendly Los Angeles guitar teachers today.